The first step of solving a problem is to understand what’s causing it. When you get a thorough understanding of the reason, it’s become easier to get to the solution. So, what causes those hard water stains to appear on the glass shower door out of nowhere? It’s the WATER itself; more like the minerals present in water. The bits of magnesium, calcium and iron present in shower water are most likely to remain on the spot if not wiped off properly; and this is exactly what happens here. It doesn’t go away and forms a stubborn stain that looks like a filthy droplet. Now, you know the reason, it’s time to think about a solution. You have to think of an effective way to get rid of the hard stains. And this is where the problem starts, removing hard water stains is not as easy as wiping off soap scum. What do you have to do to clean soap scum? Just take some detergent water and give a good solid rub using the scrub and the stain will be gone in no time. However, removing hard water stains doesn’t work the same way. You can scrub and scrub all you want, the stain won’t go away if you’re not doing it right. In order to remove the hard water stains, you need to have all the necessary cleaning supplies near your hand. Your regular glass cleansing materials won’t do, you might need to add some more stuff. Sponge or scrub is required to give a solid wipe. However, if you’re using a scrub, make sure it’s soft and not abrasive. Rough, abrasive scrubs will make the situation worse than before by leaving scratch marks on the surface. Besides, it’s easy to rinse off the stain with a sponge or soft scrub. White vinegar works as a fantastic solution for eliminating hard water stains. The acid in the vinegar reacts with the stubborn mineral on the surface and get them dissolved. As we’ve already mentioned above, acid works best with this sort of stain. It dissolves the deposited bit fast and you get a clean surface. So you can pick some acidic cleaner too as a substitute. However, since acid is involved here, you have to be extra careful. You can’t just grab any acidic solution and start using it on the stain, it has to be safe for both you and your glass shower door. Besides, all types of acid are not gonna be effective for this problem. If you’re willing to take a usual route, you can go with dishwashing soap instead of vinegar or acidic cleaner. However, it might take more time and effort to clean those stains as it’s actually intended for bringing glistening effect more than fighting with stubborn stains. Water, Baking Soda, salt Or Lemon Juice: These things should rather be used for making an effective solution to fight deposited bits of minerals in the stain. For instance, you HAVE TO mix water with white vinegar in order to make it work. Baking soda, salt and lemon juice are meant to work in the same way. You either make a paste or liquid solution using these ingredients to make the task easier. You can’t just pour dishwashing soap or vinegar solution over the glass surface, you have to sprinkle them on the spot to let the material do its job. You’ll need a spray bottle for this reason. Once you’ve gathered all the necessary stuff, start focusing on the cleaning process. Mix white vinegar with water. Remember, the proportion has to be accurate in order to be effective. Take equal proportion of both to get the solution right. Take the bottle and start sprinkling it over the glass Start with a little spot first. Soak the sponge or soft scrub, it needs to be damp in order to rinse the stain. Give a solid wipe over the sprinkled solution and then wait for the solution to rest, it will take several minutes. Since we’re talking wet solution, it’s obvious that it will start drying out after seconds. Continue spraying if that happens in order to keep the glass door wet for several minutes (more than five minutes actually). Take the shower head or a spray pipe to clean off the solution from the spot with warm water. The stain will no longer be there after that. The process is pretty much the same as the vinegar one, just the cleaning material is different. However, be careful with the proportion here, don’t use too much acid or the outcome won’t be a very pleasant one. Make a foaming mixture of soap and water. You can add some salt here if you want to, salt works as a great element to loosen the bond of minerals. Soak a sponge or soft scrub into the soap water. 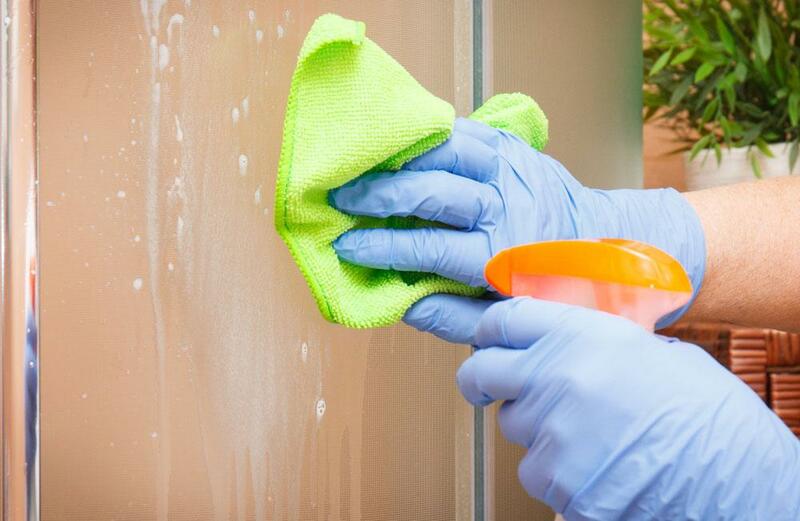 Give a solid but gentle rub with the scrub or sponge onto the glass door. Pour or spray warm water on the surface afterward to clean the foaming scum, the stain will go away with the foam. You can apply the paste the same way you use dishwashing soap. However, the solution won’t work if the proportion or the timing isn’t right, be careful about that. We believe you’re gonna be pretty careful while taking care of the stain, but a little bit of mistake can still spoil the whole thing for you, right? Let’s make sure that you’re not forgetting the vital stuff. The solution mustn’t get dry on the spot. The stains will be impossible to get rid of if this happens. Also, the dried solution will come across as a hard stain itself. Always use warm water. Cold water isn’t that effective for fighting hard stains. Instead of wiping in one direction, twirl the scrub/sponge in all directions. Working with a hot glass surface is never a good idea. Now you know the best ways to remove hard water stains from the glass shower door. You may also like to read how to wash bathroom rugs.